The Polish army moves on. The top picture shows General Jan Holowczynski who commands the right wing cavalry. He is a Foundry figure next to a TAG standard bearer or pancerni lancer. Although the Foundry figure is slightly smaller, the difference is acceptable. The middle picture shows Klemens of Moskorzew Pancerni Banner, a small unit of six. TAG figures again. 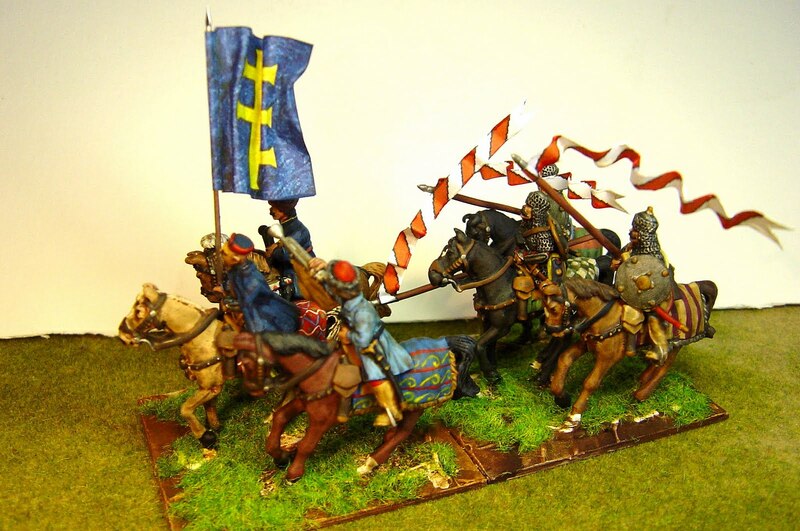 The bottom picture shows more Foundry figures – a Cossack skirmishing unit. The Cossacks are some of the nicest Foundry (Copplestone) figures available. I’ve been busy painting up background stuff the last few weeks by which I mean Gallic slingers and archers for the game we will have next month. They are Old Glory figures (cheap and nasty) and certainly not good enough to show you. 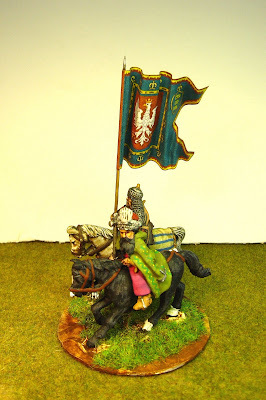 But I needed thirty of each for the Sotiate Gallic army and these were the cheapest available. I have not enjoyed painting them but such are the woes of duty! I’m hoping that all the Polish right wing cavalry will soon be finished. Considering we are only talking about 60 figures I must admit to myself that I have created a mountain out of a molehill and been lacking somewhat in courage and fortitude. I think that is because I wanted to do a 'good job' and these colourful fellows have been taxing. No more excuses otherwise I will have to dust off the hair suit! Very nice work, nice banners too!